Chocolate brownies have always been on the very top of my list, when the list have the name cake-list. But lately, my absolute love for chocolate brownies, have fallen to second place, and have been replaced by this cake. In general I have always had a love for the sour tasting, but lately that love have been growing bigger. I still LOVE chocolate and sweet sweet cakes, but often I just rather want to go for the sour taste. One pie dish. I made this one for 8 people and there was some left. (But my family don´t eat so much). Mix the flour, icing sugar, vanilla sugar and salt, and crumble the butter into the flour mixture with your fingers until there are no more butter lumps. Add the egg last. Don´t knead it more then necessary. The dough must rest in the refrigerator for about an hour(my only rested 1/2 an hour, it´s not optimal, but if you don´t have more time, then it will do). Roll out the dough and place in the pie dish. It must be baked blind, which means that you must cover the pie crust with baking paper and put rice / beans / chickpeas in, to keep the dough down during baking. Bake it for 15 min at 220 ° C, after 15 min you remove the baking paper and bake it for another 5 minutes or until it´s golden. Increase oven temperature to 150 degrees the last 5 minutes. Grate the lemons and filiter them. Blend it with sugar, eggs and egg yolks. Then you whipping the cream in. 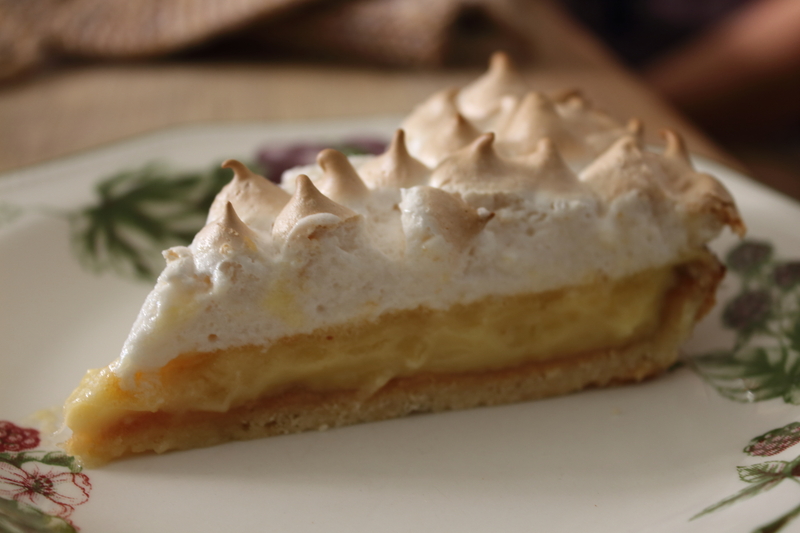 The cream is then poured into the pie shell and bake for about 30 minutes at 150 degrees. It is complete when the cream has set. Let the pie cool. 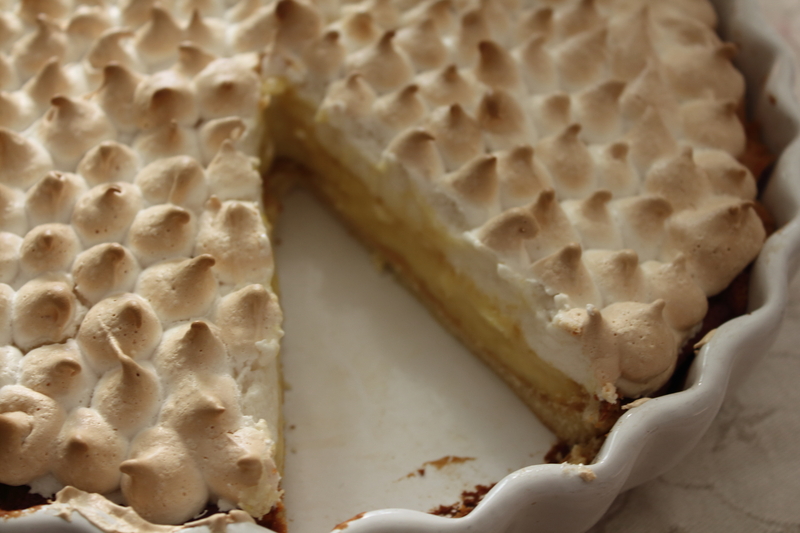 This is the easy way to do it: Stir the egg whites and the sugar till it´s firm. Then add one teaspoon of vinegar and stir it until it´s so firm, that you can turn the bowl upside down, with out it falling out. 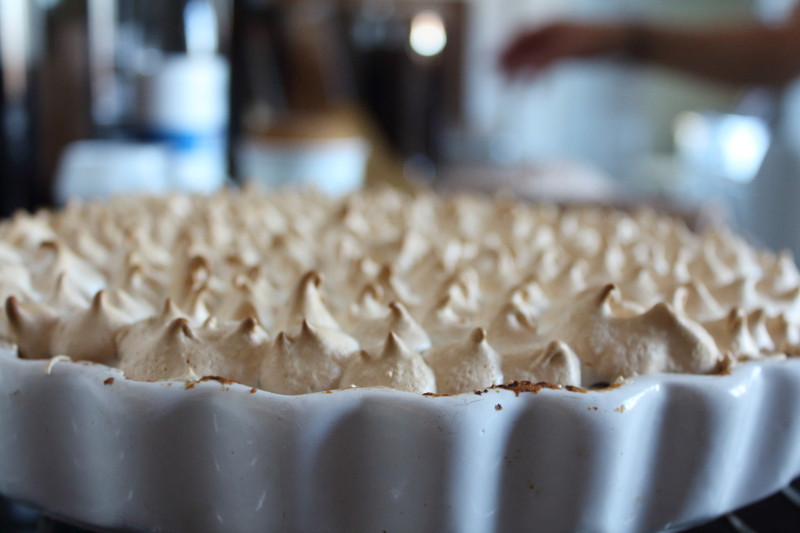 After it´s baked and cooled of, you need to put the meringue on. 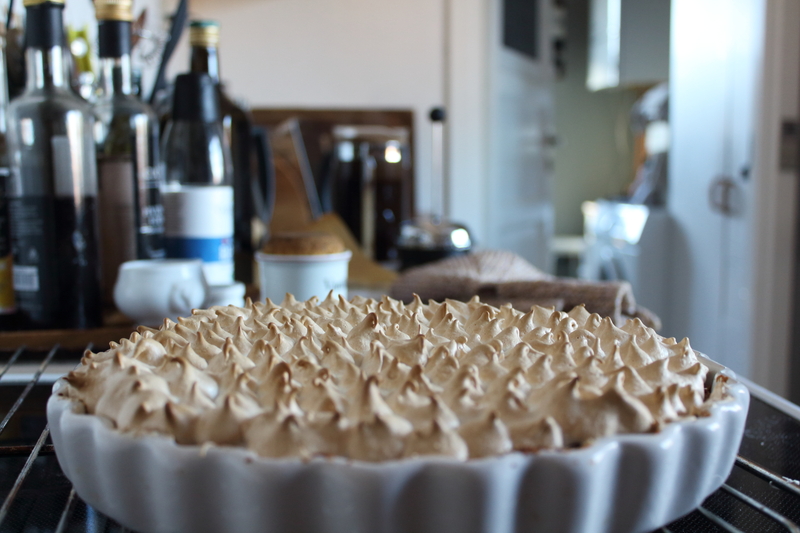 I used a little plastic bag to do my meringue top. I have an actual thing to make it with, but I was at my mom´s making it, and that was at my home, so I used a plastic bag. 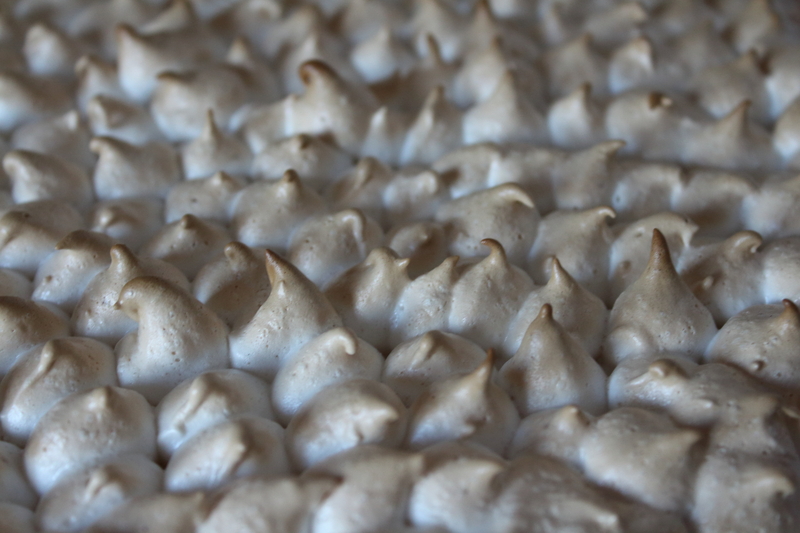 Put all of the meringue in the bag, and cut a little hole in one of the corners. Not too small, but the size to make some sort of decoration. You can also just smear it on. But I liked it like this. Put it in the oven at 180 ° C until it´s golden. Let it cool before eating it(we didn´t). 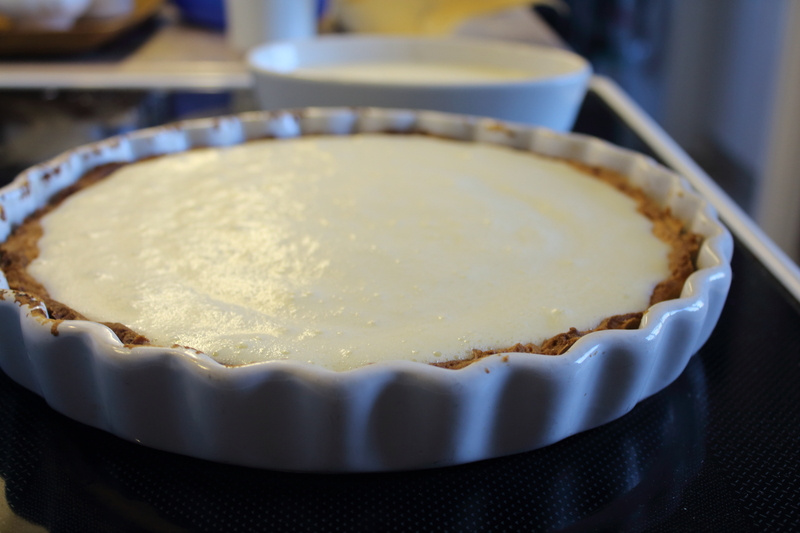 I, by the way, Made this pie for easter dinner with my mom´s side of the family, and they all loved it. My uncle sounded like that he never tried anything like it, even though he have a wife who is really good at cooking and a son who is also really good. I think the sweet sour combo surprised him. Actually most of my moms side of the family is really good at cooking and also they a really passionated about it. I love eating at my mom´s, because it´s always so good. Her husband makes the best bearnaise sauce I have ever tasted. There really is a love for good food in my moms side of the family. My brother also liked my pie. He almost ate the entire piece that I gave to him. He is not much of a cake man, or anything sweet, so that is a big compliment. My brother do like candy and sweet things, just in very moderate amounts. I wanted to post this last week, but I have had some problems with my camera. Not that there is anything wrong with it, just that I´m an idiot and I´m not very technical. But I am trying to improve. And now I have learned something new about my camera, so that´s a win win for me. Have a really great day and be happy. This entry was posted in Cake, Food, Sweets and tagged cake, citron, Denmark, easter, family, good, lemon, meringue, organic, Pie, tarte. Bookmark the permalink. Hell Yeah! That looks INCREDIBLE!